Game Night: 27 February 2007 | Kris Johnson's Blog…sort of. The evening began with Marvel Ultimate Alliance, which may be the last great game for the Xbox Classic. Miscellaneous G™ and I continued our assault on Atlantis with our Femme Fatale squad (Invisible Woman, Marvel Girl, Spider Woman and Storm). S.H.I.E.L.D. sent the heroes to investigate a coup in the undersea kingdom that appeared to have ties to Doctor Doom’s new villainous organization. The heroes found that Attuma, a warlord who believes he is fated to rule Atlantis, had stolen the throne from Namor, the Sub-Mariner. Attuma was using sonic emitters — devices apparently supplied by Doctor Doom — to play havoc with the Atlanteans’ emotions and turn them against Namor and all surface dwellers. At about 9:30, our special guest gamer, Gus, arrived. We turned off the Xbox, examined the vast array of board and card games at our disposal (most contained within Miscellaneous G™’s awesome Geek Box) and Monsters Menace America, which none of us had ever played (in fact, it had not yet been removed from its cellophane womb). 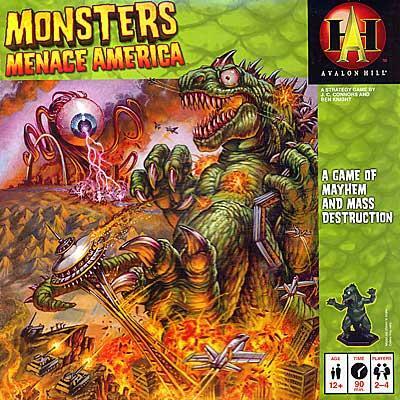 Monsters Menace America is a board game in which players control giant monsters rampaging through North America. Each player also controls the deployment of one branch of the military. The object of the game is to gain health and Infamy by stomping cities, military bases and other locations (typically tourist attractions and monuments such as Carhenge, Graceland and Mount Rushmore) in preparation for the Monster Challenge, a monster-on-monster brawl that determines which monster reigns supreme. We started out slowly, fumbling through the rules a bit and not certain what our strategies should be, especially around the deployment and movement of military units. I played Toxicor, a towering radioactive purple blob, and controlled the Air Force’s fighter jets and cruise missiles. Toxicor first appeared near Lake Ontario and stomped all over Cleveland and Detroit, completely ignoring the smorgasbord of cities along the eastern seaboard. In Florida, the monocular menace known as Zorb (played by Gus, who also controlled the Army) trashed Tampa and mauled Miami, then started making its way up the east coast toward Boston and New York. Each stomped city grants the stomping monster additional health points, and larger cities provide big bonuses. Zorb was heading for a veritable feast and there was nothing to slow its progress, save a handful of National Guard units. Meanwhile, on the west coast, Gigantis (an oversized praying mantis played by Laura) destroyed Los Angeles, Phoenix and several military bases, despite the brave Air Force pilots’ valiant efforts to stop the insectile marauder. Miscellaneous G™ quickly learned that Megaclaw’s lair near Montana wasn’t an ideal starting point, due to a lack of major metropolitan areas in the region. His plan to amass Infamy tokens (which could be traded for extra attacks during combat) was working well as he demolished Carhenge and other nearby attractions, but Megaclaw’s health was not rising as quickly as those monsters who were decimating the coastal regions. Unfortunately, Miscellaneous G™ had to leave before the game was over, so the hideous Megaclaw was retired, as were the Navy’s fighters and nuclear submarines. Realizing too late that Zorb was on his way to becoming unstoppable, Laura and I sent our combined military forces to the east coast. Again and again Zorb was attacked by Air Force cruise missiles and Marine Corps rocket launchers and fighter jets, but city after city fell to the creature’s deadly gaze and it grew ever more powerful. Even the mighty Mecha-Monster, a special unit I drew late in the game, proved to be little more than a minor annoyance to Zorb the Inexorable. After twenty locations had been stomped, the Monster Challenge began. Zorb challenged Toxicor, who was sorely outclassed. The poor toxic blob had a mere 8 health points (not to mention zero Infamy tokens) compared to Zorb’s 40, and was soon reduced to a purple stain that stretched from Syracuse to Rochester. Gigantis put up a much better fight, cashing in six Infamy tokens and beating Zorb to within an inch (or perhaps a dozen Health points) of his life. The awesome might of the terrible eye proved too much for the massive mantis, however, and Gigantis was ultimately destroyed. I have to admit that I completely dropped the ball in terms of strategy with Monsters Menace America. I don’t know what the hell Toxicor was doing, but it sure wasn’t collecting Infamy tokens and increasing his health in preparation for the Monster Challenge. Granted, I had a few unlucky rolls after destroying Detroit and Cleveland that resulted in Toxicor getting almost no benefit from their destruction, but it was foolish not to sweep over to New England and start wreaking havoc. Even though my strategy was lacking (okay, nonexistent), I still enjoyed Monsters Menace America a great deal and would definitely like to play it again. It’s a welcome addition to Game Night, which is itself mutating into something new; once 4+ hours of video gaming every other Tuesday after work, its scope has expanded to include board and card games and a growing list of attendees. An epic game of Arkham Horror looms on the horizon, but Doctor Doom and his Masters of Evil cannot be allowed to succeed in whatever fiendish plot the masked monarch of Latveria is hatching. I’ve purchased only one of Avalon Hill’s new boxed games (since their assimilation by the Hasbro-Borg gaming collective). Unfortunately, it wasn’t Monsters Menace America! Your descriptions are evocative in the extreme, Mr. Johnson! I’ll have to seek this one out for some TNC-fun. Peace is for the conquered! I’m not familiar with Lord of the Fries, but a quick trip over to Board Game Geek reveals that it’s one of James Ernest’s Cheapass games. That in and of itself is enough to pique my interest. I just realized that I left out one of the location types: Mutate. Sites like Area 51 cause a monster to mutate when they have an encounter there. When a monster mutates, the player draws a card from the Mutation deck and their beastie gets some horrible new power. By the end of the game, Zorb could fly and had some kind of nasty tentacles that added damage to his attacks. It wasn’t pretty.